We have already discussed standing and bending backward to help reverse the effects of a bent forward back posture. We will get into some back pain exercises below, but we first need to become familiar with pain patterns to establish goals and methods to monitor progress. The exercises are not designed to strengthen muscles of the lower back. The purpose is to effect changes of the internal structures in and around the joints. By doing this, there will be changes in the intensity levels and location of pain. By monitoring these changes, you can determine if the exercises are appropriate for your low back problem and how you are progressing. When beginning these back pain exercises, you should stop any other exercises that you may be doing. The goals of these exercises are to eliminate pain and restore mobility in the low back as much as possible. This is accomplished by reducing any bulging or disc herniation. When beginning, you should move just to the point of pain and then release. The goal is to reduce pain levels. When your initial pain has subsided, you should move as much into the pain as possible or what should be felt as a tight stretch instead of pain. The goal here is to regain lost motion and reduce stiffness. When performing the back pain exercises you should notice: a) your pain resolves, 2) there may be an increase or decrease in your pain, or 3) the location of pain may change. In many people the pain first changes in location, then reduces in intensity, then resolves. The effects may be rapid or it may take a while. If your pain moves to the center of your low back and away from areas where it is usually felt, then the exercises are right for you. If your pain moves from the lower leg to the knee or above, this is a good sign. Progress is noted when the pain moves from the knee to the buttock and further indication of improvement would be noted with pain moving from the buttock to the lower back only. Any exercise or activity that causes pain to move further away from the low back should be avoided and taken as a warning that you are at increased risk of damage if you continue with that particular exercise or posture. When beginning the back pain exercises, some increase in pain can be expected, along with new aches and pains in different places. These should lessen as you continue. When finishing the exercise, make sure you maintain good posture so that you do not lose any gains you have made. If your lower back pain is significant, approach the exercises with caution and take your time. If you have chronic pain, do not expect to be pain free in a couple of days. Your response will be slower, however, if you continue the exercises and make improvements in your posture, you should see results in a couple of weeks. You should discontinue the exercises if, following some initial pain increase, the pain gets much worse and remains worse the next day, or the pain spreads further down the hip or leg. These may be uncomfortable in your back, but after a few repetitions you should feel that your leg symptoms are lessening. Scientific studies have proven that this is a good sign and means the exercises are right for you. If however, you feel your leg symptoms worsening then you are not ready for these movements yet. If you are in a lot of pain, the first step is to lay on a comfortable floor on your stomach. If you have any neck pain or experience any neck problems, it is important not to lay with your head turned to the side (rotated) for any length of period. Your arms should be down and beside your body. Stay in this position and breathe slowly relaxing as completely as possible. This exercise is mainly used for an acute episode of lower back pain and may be performed every 2 hours. You may remain in this position for as long as you feel comfortable, however, 2-3 minutes should suffice. Additionally, you should perform this for a few minutes before doing the other floor exercises and again when they are completed. A) This lower back exercise is based on the sphinx yoga posture. Lay on your stomach and relax as described above. Place your elbows underneath your shoulders. Resting on your forearms, relax and breathe deeply and rythmically. Remain in this position for a few minutes then return to the initial position of lying on the floor. This low back exercise can be repeated a few times, although when beginning, one repetition to start is fine. This can be done every 2 hours. B) This lower back exercise is based on the cobra yoga posture and is the most advanced of the floor exercises. 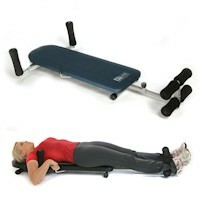 This exercise can be used for low back stiffness and to prevent low back pain from recurring. Only proceed to this if you have performed the first one (A) with good results. From the stomach lying position, place your hands under your shoulders and your hands palm down. Straighten your elbows and push the upper body up as far as pain will allow. Keep breathing and relax your lower body as you allow your lower back to sag. Hold this position for at least 1 or 2 seconds and return to starting position with your hands under your shoulders and upper body on floor. Repeat the process in a smooth motion trying to raise your upper body a little higher each time. Better results can be achieved if you breathe out when you rise and in as you relax down. Try to do 10 repetitions for the session and repeat the sessions up to every 2 hours. C) The standing back extension can be performed a few times every 20 min when you have been sitting or in any situation where you bend forward. Place your feet slightly apart with hands on the small of your lower back. This can also be performed with your hands above your head and reaching up. Bend backward as far as you can keeping your knees straight and hold for 1 to 2 seconds, then return to straight position. Whenever you are working in a slouched or bent over position or sitting for long periods you should interrupt regularly to perform this exercise. Remember, the only perfect chair is one you get out of frequently! If your lower back pain is felt more to one side than the other or if it radiates down the leg or buttock, you can modify your position before performing any of the above exercises. Begin by lying on the floor and relaxing, then shift your hips away from the painful side. 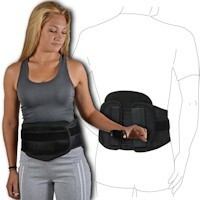 If the pain is on the left, move your hips to the right a few inches and then relax again. From this position, you then move up into the extension parts of A, B and you can even shift your hips to the opposite side while standing and bending backward. The example shows exercise B done straight and for left side primary pain with hips shifted to the right. Remember, shift you hips prior to beginning any backward bending. Always remember that if the pain is moving away from the center of your lower back and to the buttock or down the leg, you are moving in the wrong direction. Any exercise or activity that is causing this should be stopped. Pay attention to your posture at all times, sit correctly, lift using proper technique and perform the exercises as described and you should be able to make great strides in healing your back and keeping it that way. A 2016 study in the Journal of Manipulative and Physiological Therapeutics indicates using methods of these these back pain exercises can help to reverse the negative effects of sustained sitting on the discs of the lower back. 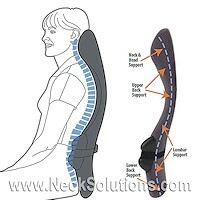 Even 5 minutes of sitting can cause the spinal discs to lose height. While better back posture and ergonomics can help, getting up and performing these exercises can have a profound effect on your lower back. There is also a sitting back exercise that is easy to perform and follows similar concepts while you are sitting in a chair.